“You want to see my cave?” asked our Bedouin guide, aka Mr. Friday. Had we not already established a trust, his proposal would have sounded like a proposition. “Yes, we’d love to,” cooed the three women. We climbed up a small slope and voila, there in the rocks was Juomaa’s front door – locked against wandering bandits. The bedroom-sized caves must have been cramped when all the cousins slept over. I imagined there was a lot of giggling at night. Without their inhabitants, the caves were not homes, and there was little else to see inside. Outside, the multi-colored stone was brilliant orange as the sun dropped. To the right of his front door was a stunning view of the Monastery. We stood enjoying a quiet anyone living in a city has never heard. The desert is a place where life is pared down to the bare minimum. You get enough water to survive – with nothing to waste. You eat to fill your belly; no left-overs that might spoil. Your possessions must fit on your back or your donkey’s. Your entertainment is Nature’s round-the-clock exhibition of her array of colors. The air was fresh, tinged with the freedom of living without masters. “It is gorgeous. I can just imagine sitting around the campfire, telling stories and watching the stars,” Louise said. Her eyes had gone dreamy again. It was a pity we were unable to enjoy the Bedouin hospitality, but the sun waits for no woman. If we wanted to end our day in true Thelma and Louise style, then we had to get to the cliff at the top of the world. Many signs pointed towards the canyon’s lip. Climbing the mountain, we rushed towards the edge, but our donkey stopped just in time. Regardless of what anyone else wanted, he refused to take that last step. Maaz’ feet hanging over cliff. Maaz stopped to lean against a fence made of sticks. My mother’s heart stopped. My friend encouraged him to step away by asking him to take her photo. Soon, he was leaping around like a mountain goat snapping shots our stomachs could not endure. “Over here,” called Juomaa. Taking off his sunglasses, he squinted and pointed west to some distant spot where his camels grazed. “Wadi Araba, my winter home. It is warmer there. Araba is the real desert.” He turned and pointed south. “Welcome home,” said the smiling Juomaa. Juomaa Kudblan, Mr. Friday, was a man we instantly felt comfortable with. His mobile is 00 962 7 7753 5425. You can arrange to meet him at the Petra entrance, or, if you are lucky, arrange to meet him at Haroun’s for a sunset trip to the Monastery. He charged us each 50JD for our four-hour tour. His rate matched the rates quoted on Frommer’s. His donkey were well-cared for, and he is a kind, stable individual. Leaving the Treasury behind, we followed a young, Jordanian couple. Wearing city attire, they looked like tourists, not Bedouin. I assumed they were newly-married since the man could not stop taking pictures of the young woman wearing hijab. At the amphitheater, we caught up with them. They asked us to take their photo together, and we did, insisting that they do all sorts of fun poses. Across the street, I recognized the stall selling Marguerite’s book, Married to a Bedouin. A little higher than the road, it sat next to the WCs carved out of the red cliff. 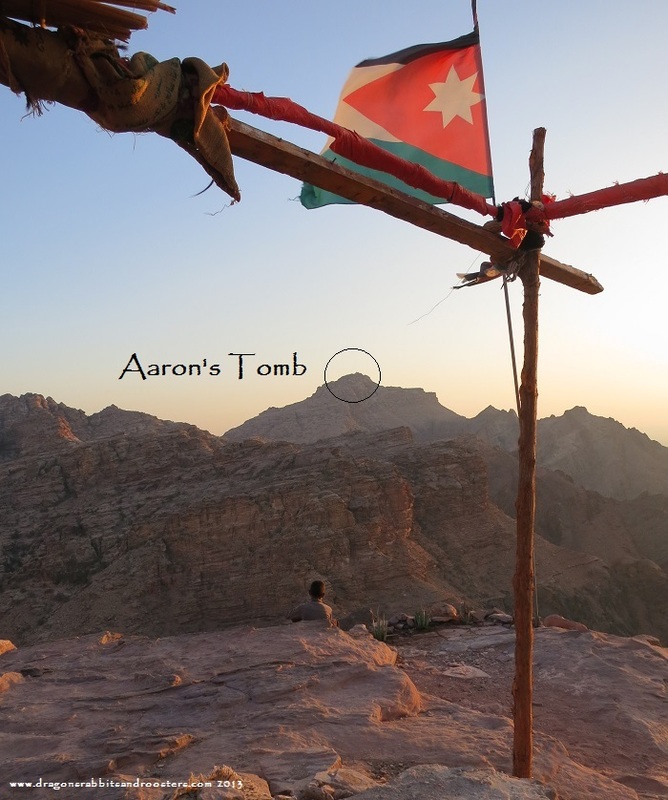 I might go back and see if I can find a Petra I can live in without Mohammed…..Without Mohammed to hold me I am no longer married to a Bedouin and, despite all the things we have accumulated, I have become a nomad once again. I pointed out the stall. There, dressed in western clothes, was Marguerite! We rushed towards her, gushing. When Marguerite smiled her gold tooth, a present from her father-in-law, gleamed. Time healed her broken heart, and, once again, she found herself living with the Bdouls near Petra. Her children were grown with families of their own. No longer a nurse, she was a published author and “doing something fun” – creating jewelry. Inspired by the Nabataen carvings, local women smithed the silver jewelry. The Amarat Jewelry Workshop helped support eleven families. As much as we wanted to talk, Marguerite was busy. She only had seconds to entice the dusty, hot tourists walking by to either purchase a book or some earrings. As we stood there, a Mexican, then a Greek tour group huddled around her stall as she said a few words to them in their own language. Happy to support a fellow adventurer, mother and writer, I purchased a charm – the out-lawed goddess, al-Uzza. Al-Uzza, “The Powerful One”, was part of the original, Arabian goddess triade. Some archaeologists say she was the Nabataen equivalent to Aphrodite, but, according to Barbara Walker, she was older than that. Marguerite strung my Uzza on a black, braided cord. When you go to Petra you will find either Marguerite or her handsome son tending the shop. Like the other vendors, at night, they shuttered their stand and, guarded by The Powerful One, everything stays where they left it.